"Larp" redirects here. For other uses, see Larp (disambiguation). A live action role-playing game (LARP) is a form of role-playing game where the participants physically portray their characters. The players pursue goals within a fictional setting represented by the real world while interacting with each other in character. The outcome of player actions may be mediated by game rules or determined by consensus among players. Event arrangers called gamemasters decide the setting and rules to be used and facilitate play. LARP has also been referred to as live role-playing (LRP), interactive literature, and free form role-playing. Some of these terms are still in common use; however, LARP has become the most commonly accepted term. It is sometimes written in lowercase, as larp. The live action in LARP is analogous to the term live action used in film and video to differentiate works with human actors from animation. Playing a LARP is often called larping, and one who does it is a larper. The participants in a LARP physically portray characters in a fictional setting, improvising their characters' speech and movements somewhat like actors in improvisational theatre. This is distinct from tabletop role-playing games, where character actions are described verbally. LARPs may be played in a public or private area and may last for hours or days. There is usually no audience. Players may dress as their character and carry appropriate equipment, and the environment is sometimes decorated to resemble the setting. LARPs can be one-off events or a series of events in the same setting, and events can vary in size from a handful of players to several thousand. Events are put on for the benefit of the players, who take on roles called player characters (PCs) that the players may create themselves or be given by the gamemasters. Players sometimes play the same character repeatedly at separate events, progressively developing the character and its relations with other characters and the setting. Arrangers called gamemasters (GMs) determine the rules and setting of a LARP, and may also influence an event and act as referees while it is taking place. The GMs may also do the logistical work, or there may be other arrangers who handle details such as advertising the event, booking a venue, and financial management. Unlike the GM in a tabletop role-playing game, a LARP GM seldom has an overview of everything that is happening during play because numerous participants may be interacting at once. For this reason, a LARP GM's role is often less concerned with tightly maintaining a narrative or directly entertaining the players, and more with arranging the structure of the LARP before play begins and facilitating the players and crew to maintain the fictional environment during play. Participants sometimes known as the crew may help the GMs to set up and maintain the environment of the LARP during play by acting as stagehands or playing non-player characters (NPCs) who fill out the setting. Crew typically receive more information about the setting and more direction from the GMs than players do. In a tabletop role-playing game, a GM usually plays all the NPCs, whereas in a LARP, each NPC is typically played by a separate crew member. Sometimes players are asked to play NPCs for periods of an event. Much of play consists of interactions between characters. Some LARP scenarios primarily feature interaction between PCs. Other scenarios focus on interaction between PCs and aspects of the setting, including NPCs, that are under the direction of the GMs. The earliest recorded LARP group is Dagorhir, which was founded in 1977 in the United States and focuses on fantasy battles. Soon after the release of the movie Logan's Run in 1976, rudimentary live role-playing games based on the movie were run at US science fiction conventions. In 1981, the International Fantasy Gaming Society (IFGS) started, with rules influenced by Dungeons & Dragons. IFGS was named after a fictional group in the 1981 novel Dream Park, which described futuristic LARPs. In 1982, the Society for Interactive Literature, a predecessor of the Live Action Roleplayers Association (LARPA), formed as the first recorded theatre-style LARP group in the US. Treasure Trap, formed in 1982 at Peckforton Castle, was the first recorded LARP game in the UK and influenced the fantasy LARPs that followed there. The first recorded LARP in Australia was run in 1983, using the science fiction Traveller setting. In 1993, White Wolf Publishing released Mind's Eye Theatre, which is still played internationally and is probably the most commercially successful published LARP. The first German events were in about 1994 (other sources claim 1992 or 1991), with fantasy LARP in particular growing quickly there, so that since 2001, two major German events have been run annually that have between 3000 and 7000 players each and attract players from around Europe. Most LARPs are intended as games for entertainment. Enjoyable aspects can include the collaborative creation of a story, the attempt to overcome challenges in pursuit of a character's objectives, and a sense of immersion in a fictional setting. LARPs may also include other game-like aspects such as intellectual puzzles, and sport-like aspects such as fighting with simulated weapons. Some LARPs stress artistic considerations such as dramatic interaction or challenging subject matter. Avant-garde or arthaus events have especially experimental approaches and high culture aspirations and are occasionally held in fine art contexts such as festivals or art museums. The themes of avant-garde events often include politics, culture, religion, sexuality and the human condition. Such LARPs are common in the Nordic countries but also present elsewhere. In addition to entertainment and artistic merit, LARP events may be designed for educational or political purposes. For example, the Danish secondary school Østerskov Efterskole uses LARP to teach most of its classes. Language classes can be taught by immersing students in a role-playing scenario in which they are forced to improvise speech or writing in the language they are learning. Politically themed LARP events may attempt to awaken or shape political thinking within a culture. Because LARP involves a controlled artificial environment within which people interact, it has sometimes been used as a research tool to test theories in social fields such as economics or law. For example, LARP has been used to study the application of game theory to the development of criminal law. During a LARP, player actions in the real world represent character actions in an imaginary setting. Game rules, physical symbols and theatrical improvisation are used to bridge differences between the real world and the setting. For example, a rope could signify an imaginary wall. Realistic-looking weapon props and risky physical activity are sometimes discouraged or forbidden for safety reasons. While the fictional timeline in a tabletop RPG often progresses in game-time, which may be much faster or slower than the time passing for players, LARPs are different in that they usually run in real-time, with game-time only being used in special circumstances. There is a distinction between when a player is in character, meaning they are actively representing their character, and when the player is out-of-character, meaning they are being themselves. Some LARPs encourage players to stay consistently in character except in emergencies, while others accept players being out-of-character at times. In a LARP, it is usually assumed that players are speaking and acting in character unless otherwise noted, which is the opposite of normal practice in tabletop role-playing games. Character knowledge is usually considered to be separate from player knowledge, and acting upon information a character would not know may be viewed as cheating. While most LARPs maintain a clear distinction between the real world and the fictional setting, pervasive LARPs mingle fiction with modern reality in a fashion similar to alternate reality games. Bystanders who are unaware that a game is taking place may be treated as part of the fictional setting, and in-character materials may be incorporated into the real world. Many LARPs have game rules that determine how characters can affect each other and the setting. The rules may be defined in a publication or created by the gamemasters. These rules may define characters' capabilities, what can be done with various objects that exist in the setting, and what characters can do during the downtime between LARP events. Because referees are often not available to mediate all character actions, players are relied upon to be honest in their application of the rules. Some LARP rules call for the use of simulated weapons such as foam weapons or airsoft guns to determine whether characters succeed in hitting one another in combat situations. In Russian LARP events, weapons made of hard plastic, metal or wood are used. The alternative to using simulated weapons is to pause role-play and determine the outcome of an action symbolically, for example by rolling dice, playing rock-paper-scissors or comparing character attributes. There are also LARPs that do without rules, instead relying on players to use their common sense or feel for dramatic appropriateness to cooperatively decide what the outcome of their actions will be. LARPs can have any genre, although many use themes and settings derived from genre fiction. Some LARPs borrow a setting from an established work in another medium (e.g., The Lord of the Rings or the World of Darkness), while others use settings based on the real world or designed specifically for the LARP. Proprietary campaign settings, together with rulesets, are often the principal creative asset of LARP groups and LARP publishers. LARPs set in the modern day may explore everyday concerns, or special interests such as espionage or military activity. Such LARPs sometimes resemble an Alternate Reality Game, an Assassin game, or a military simulation using live combat with airsoft, laser tag, or paintball markers. LARPs can also be set in historical eras or have semi-historical settings with mythological or fantastical aspects incorporated. Fantasy is one of the most common LARP genres internationally and is the genre that the largest events use. Fantasy LARPs are set in pseudo-historical worlds inspired by fantasy literature and fantasy role-playing games such as Dungeons & Dragons. These settings typically have magic, fantasy races, and limited technology. Many fantasy LARPs focus on adventure or on competition between character factions. In contrast, science fiction LARPs take place in futuristic settings with high technology and sometimes with extraterrestrial life. This describes a broad array of LARPs, including politically themed LARPs depicting dystopian or utopian societies and settings inspired by cyberpunk, space opera and post-apocalyptic fiction. Horror LARPs are inspired by horror fiction. Popular subgenres include zombie apocalypse and Cthulhu Mythos, sometimes using the published Cthulhu Live rules. The World of Darkness, published by White Wolf Publishing, is a widely used goth–punk horror setting in which players usually portray secretive supernatural creatures such as vampires and werewolves. This setting can be played using Mind's Eye Theatre, which is a set of LARP rules also published by White Wolf. World of Darkness LARPs are usually played in a chronicle, a series of short events held at regular intervals, and are also popular at conventions. An international chronicle is run by White Wolf's official fan club, the Camarilla. LARP events have a wide variety of styles that often overlap. Simple distinctions can be made regarding the genre used, the presence of simulated weapons or abstract rules, and whether players create their own characters or have them assigned by gamemasters. There is also a distinction between scenarios that are only run once and those that are designed to be repeatable. A number of other common classifications follow. Theatre-style, or freeform, LARP is characterised by a focus on interaction between characters that are written by the gamemasters, not using simulated weapons for combat, and an eclectic approach to genre and setting. Events in this style typically only last a few hours and require relatively little preparation by players and are sometimes played at gaming conventions. 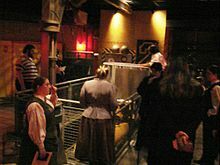 Some murder mystery games where players are assigned characters and encouraged to roleplay freely also resemble theatre-style LARP. Some very large events known as fests (short for festival) have hundreds or thousands of participants who are usually split into competing character factions camped separately around a large venue. There are relatively few fests in the world, all based in Europe and Canada; however, their size means that they have a significant influence on local LARP culture and design. At the other end of the size scale, some small events known as linear or line-course LARPs feature a small group of PCs facing a series of challenges from NPCs and are often more tightly planned and controlled by GMs than other styles of LARP. While some LARPs are open to participants of all ages, others have a minimum age requirement. There are also youth LARPs, specifically intended for children and young people. Some are run through institutions such as schools, churches, or the Scouts. Denmark has an especially high number of youth LARPs. Roleplaying may be seen as part of a movement in Western culture towards participatory arts, as opposed to traditional spectator arts. Participants in a LARP cast off the role of passive observer and take on new roles that are often outside of their daily life and contrary to their culture. The arrangers of a LARP and the other participants act as co-creators of the game. This collaborative process of creating shared fictional worlds may be associated with a broader burgeoning "geek" culture in developed societies that is in turn associated with prolonged education, high uptake of information technology and increased leisure time. In comparison to the mainstream video-game industry, which is highly commercialized and often marketed towards a male audience, LARP is less commoditized, and women actively contribute as authors and participants. LARP is not well known in most countries and is sometimes confused with other role-playing, reenactment, costuming, or dramatic activities. While fan and gamer culture in general has become increasingly mainstream in developed countries, LARP has often not achieved the same degree of cultural acceptability. This may be due to intolerance of the resemblance to childhood games of pretend, a perceived risk of over-identification with the characters, and the absence of mass marketing. In US films such as the 2006 documentary Darkon, the 2007 documentary Monster Camp, and the 2008 comedy Role Models, fantasy LARP is depicted as somewhat ridiculous and escapist, but also treated affectionately as a "constructive social outlet". In the Nordic countries, LARP has achieved a high level of public recognition and popularity. It is often shown in a positive light in mainstream media, with an emphasis on the dramatic and creative aspects. However, even in Norway, where LARP has greater recognition than in most other countries, it has still not achieved full recognition as a cultural activity by government bodies. Communities have formed around the creation, play and discussion of LARP. These communities have developed a subculture that crosses over with role-playing, fan, reenactment, and drama subcultures. Early LARP subculture focused on Tolkien-like fantasy, but it later broadened to include appreciation of other genres, especially the horror genre with the rapid uptake of the World of Darkness setting in the 1990s. Like many subcultures, LARP groups often have a common context of shared experience, language, humour, and clothing that can be regarded by some as a lifestyle. LARP has been a subject of academic research and theory. Much of this research originates from role-players, especially from the publications of the Nordic Knutepunkt role-playing conventions. The broader academic community has recently begun to study LARP as well, both to compare it to other media and other varieties of interactive gaming, and also to evaluate it in its own right. In 2010, William Bainbridge speculated that LARP may one day evolve into a major industry in the form of location-based games using ubiquitous computing. ^ a b c (Tychsen et al. 2006:255) "LARPs can be viewed as forming a distinct category of RPG because of two unique features: (a) The players physically embody their characters, and (b) the game takes place in a physical frame. Embodiment means that the physical actions of the player are regarded as those of the character. LARP participants may dress in the costume of their character and carry appropriate physical props (e.g., an 18th century militia LARP participant may wear a military uniform and carry a musket). Whereas in a RPG played by a group sitting around a table, players describe the actions of their characters (e.g., "I run to stand beside my friend"); in an equivalent situation in a LARP, a player would physically run to the appropriate point within the game space." ^ (Tychsen et al. 2006:255) "LARP ... is the commonly accepted term in the gaming community." ^ (Fatland 2005:1) "The non-Nordic reader should, however, keep in mind that there are some differences between the Nordic and Anglo-American uses of English when talking about larp. Most importantly, we treat 'larp' as a word in its own right, not an acronym (L.A.R.P. ), and it is spelt lower-case." ^ (Kilgallon et al. 2001:1) "A live action roleplaying game is a cross between a traditional 'tabletop' roleplaying game and improvisational theatre." ^ Salen, Katie; Zimmerman, Eric (2003). Rules of Play: Game Design Fundamentals. The MIT Press. ISBN 978-0-262-24045-1. Live-Action Role-Playing Games can take place in indoor or outdoor settings, in private or public spaces. ^ (Falk & Davenport 2004:128) "...live role-playing games are devoid of the audience concept." ^ (Falk & Davenport 2004:131) "The LRP player, like a stage actor, is a person who under-goes a transformation into a character. The character's costume and accessories, or kit, aids this transformation ... Physical structures may be used as game locations, and sometimes even purposely constructed to enhance the game world ... Players frequently use physical artifacts as props and tools in their role-play, primarily to back up their character roles." ^ (Tychsen et al. 2006:259) "Most LARPs are either scenarios (or single-shots) or campaigns (also known as chronicles)"
^ (Tychsen et al. 2006:258) "Games range in size from a handful to more than 4,000 players"
^ (Tychsen et al. 2005:216) "In order to play, the players must have a fictional setting... In essence, the GM creates the magical circle around the game." ^ (Montola, Stenros & Waern 2009) "Runtime game mastering is the process of influencing the flow of a game in real time." ^ (Tychsen et al. 2005:218) "The GM may or may not be responsible for enforcing the rules between players... The GM can also be responsible of [sic] hunting down cheaters or other rule breakers." ^ (Tychsen et al. 2005:218) "[The GM is] forced to let go of the game and let it take on a life of its own outside his or her control. While based on similar principles, the requirements [are] therefore very different in practice from GMs in PnP RPGs... The GM is generally, unless the LARP is small in terms of number of participants, not responsible for keeping the narrative flow. The GM can however oversee the progress of the game and help or influence where needed... Establishing a hierarchy of GMs and NPCs to monitor the game and ensure everyone is entertained and activated within the shared game space is a typical way of controlling large fantasy LARPS. This structure is usually established before the game commences." ^ (Bestul 2006:26) "Finally, a person may also participate as a type of stagehand. Though not all games will require them, it is occasionally necessary to have a support staff to help coordinate events and NPCs as a stage manager or running crew might." ^ (Tresca 2010:188) "Where LARPs differ most from tabletop games is in the handling of non-player characters (NPCs). The physical performance necessary to pull off a performance in a LARP makes it impractical for a single person to handle many NPC roles. As a result, there is often a cast of characters who take on the roles of other NPCs. Unlike the players, the NPCs usually know the game's plot and have some idea of the narrative. NPCs, then, are a form of pseudo-player. They play the game, their characters have somewhat more limited goals, but they are ultimately constrained by the plot." ^ (Young 2003:11) "The focus of interaction of larp... can be player to player or player to environment." ^ (Tychsen et al. 2005:216) "LARP scenarios can likewise vary from detailed scripts of each participating character, to a loose association of GM-controlled NPCs in a fictional world setting." ^ (Tychsen et al. 2006:256) "LARPs ... appear to have developed based on inspiration from tabletop RPGs such as Dungeons & Dragons, more or less simultaneously in North America, Europe, and Australia in the early 80s. Players from all of these continents claim to have hosted the oldest LARP, however, it appears that LARPs developed independently and with marked cultural differences." ^ Morton, Brian (2007). "Larps and their Cousins through the Ages" (PDF). In Donnis, Gade & Thorup. Lifelike. Knudepunkt 2007. Archived from the original (PDF) on 2009-02-05. Retrieved 2008-05-21. ^ Dagorhir. "The Origins of Dagorhir". Dagorhir website. Archived from the original on 2007-06-29. Retrieved 2007-07-28. ^ Muir, John Kenneth. "Logan's Run: The Series". John Kenneth Muir website. Retrieved 2007-10-19. ^ Lancaster, Kurt (1999). Warlocks and Warpdrive: Contemporary Fantasy Entertainments With Interactive and Virtual Environments. McFarland. p. 34. As a likely result of the popularity of Dungeons and Dragons, in 1981 the International Fantasy Gaming Society (IFGS) was formed, and it published a set of rules for an outdoor, fantasy role-playing game similar to the medieval-fantasy environment of D&D. ^ IFGS. "History of the IFGS". IFGS website. Retrieved 2007-07-29. ^ Olmstead-Dean, Gordon (1998). "Theatre Style Live Roleplaying Events". LARP Writing.org. Archived from the original on 2008-06-07. Retrieved 2008-05-29. In 1982, Walt Frietag and some friends at Harvard University "invented" what they called "interactive literature."... Frietag called his group the "Harvard Society for Interactive Literature", which was shortened to "Society for Interactive Literature" the next year. ^ Ian Livingstone (1982). Dicing with Dragons. Routledge. pp. 194–196. ISBN 9780710094667. ^ Hook, Nathan (2006-06-05). "The History of UK LARP". The LARP Magazine Newsletter. 2. Archived from the original on 2007-11-03. ^ a b Appelcline, Shannon (2007-02-01). "A Brief History of Game #11: WHITE WOLF, PART ONE: 1986-1995". RPGnet. Skotos Tech. Retrieved 2007-11-03. ^ "Drakon I (August 1992)". Retrieved April 25, 2014. ^ (Tychsen et al. 2006:258) "Today, LARPing is a widespread hobby, especially within the United States and Europe, and caters to at least 100,000 players worldwide ... Professional, full-time LARP sites also exist ... a small industry has grown-up supplying latex weapons, costumes, theater props, and special effects, and numerous special effects and make-up artists work in the LARP environment for training purposes." ^ Bøckman, Petter (2003). "The Three Way Model" (PDF). As Larp Grows Up. Knudepunkt 2003. Archived from the original (PDF) on 2011-07-19. Retrieved 2011-01-23. ^ Bienia, Rafael,. Role Playing Materials. Dissertation. Maastricht University. ISBN 9783938922620. OCLC 981122410. ^ Bressanin, Anna (2012-05-02). "Fantasy dressing up for live-action roleplay games". BBC News Online. Retrieved 2012-05-03. Nordic art larp is more about exploring a particular emotion, or taking a journey into your own psyche. ^ Hyltoft, Malik (2008). "The Role-Players' School: Østerskov Efterskole". In Markus Montola, Jaakko Stenros. Playground Worlds. Ropecon ry. ISBN 978-952-92-3579-7. ^ " Cheng, Michael (2007). "Student perceptions of interactive drama activities" (PDF). Journal of Interactive Drama. 2 (3). pp. 1–26. ^ (Montola, Stenros & Waern 2009) "Some pervasive larps seek to engage in active dialogue with their social environment. The purpose of such dialogue can be politically or artistically motivated. These games have a message that is aimed either at the players, at bystanders, or society as a whole." ^ Andersen, Anita Myhre; Aarebrot, Erik (2009). "Larp in Kamensky forest" (PDF). Larp, the Universe and Everything. Knutepunkt 2009. Retrieved 2009-05-05. ^ Cantine, Tom (1996). "The Role of Detection in Rule Enforcement". Masters Thesis. Hamilton: McMaster University. Retrieved 2009-12-22. ^ (Bestul 2006:28) "All of this, with the occasional exceptions, takes place in real-time, with the idea of game-time only invoked in certain situations (combat or emergencies, for example). " ^ (Waern, Montola & Stenros 2009:1550) "[In Nordic 360° illusion larp] the players stay in character continuously (unlike American larp as reported by Lancaster)"
^ (Tresca 2010:190) "Generally speaking, players in a larp are usually expected to be in character first and then signal their desire to speak or act out-of-character second, the reverse of a tabletop game." ^ Markus, Montola (2007-09-24). "Tangible Pleasures of Pervasive Role-Playing" (PDF). In Baba, Akira. Proceedings of DiGRA 2007 Situated Play conference. The University of Tokyo. pp. 178–185. Retrieved 2008-06-04. Alternate reality gaming is the most widely established subgenre of pervasive gaming, but others are evolving as well. ^ (Tychsen et al. 2005:216) "Rules in RPGs ... focus on 1) How the fictional world operates; 2) How the players interact with the fictional world and its inhabitants and; 3) How the players interact with each other and the GM." ^ (Tychsen et al. 2005:218) "In PnP RPGs and LARPs, the GMs can be responsible for creating the rules, if an existing RPG rules system is not used." ^ Ed Grabianowski (June 27, 2008). "How To Become a Real Space Marine". io9/Gawker Media. Archived from the original on 2010-07-29. Retrieved 29 July 2010. ^ Kann, Taisia; Rozhkov, Viacheslav (2010). "Larp instead of communism: history and evolution of live-action role-playing in Russia". In A. Castellani. Larp graffiti: preistoria e presente dei giochi di ruolo dal vivo. Larp Symposium 2010. pp. 171–182. Retrieved 2013-10-11. ^ (Young 2003:7-8) "Live combat... requires the players' abilities to perform an action. You want to hit someone with a sword? You have to actually hit the player with a prop representing a sword, usually a padded weapon. ... Simulated combat is more abstract. It uses an external method that does not rely on player ability. For example, if you want to hit the other person with a sword, you may have to make a rock-paper-scissors challenge." ^ (Tychsen et al. 2006:255) "...a LARP can be very similar to improvisational theater, with only a few guidelines for rules and a very low-powered GM." ^ (Falk & Davenport 2004:129) "All LRP games of our definition take place within an agreed upon theme or narrative setting that provides the context for players' actions and character roles. This theme can be pretty much anything you can imagine; the possibilities are inexhaustible. To give some obvious and common examples, it may be fantasy and involve magic, heroes, and fantastic creatures, much like the game world settings of the classic tabletop role-playing games. Or, it may be realistic, based on historic events or contemporary life. Or it can be futuristic post apocalyptic environments, involving mutants and cyborgian characters dwelling in deserted cities. Or, it can be any combination of these"
^ (Tychsen et al. 2006:261) "The world setting or framework for the fictional world in which the game takes place varies greatly in LARPs. Generally, these can be divided into either real-world settings or fictional settings." ^ (Tychsen et al. 2006:258) "Exclusively, the large LARPs with hundreds or more players are set in fantasy/medieval world settings, which is the historic genre for LARPs." ^ Harviainen, J Tuomas (2009). Notes on designing repeatable larps (PDF). Larp, the Universe and Everything. Knutepunkt 2009. Retrieved 2009-05-05. ^ "About the IFGS". International Fantasy Gaming Society. Archived from the original on 2007-12-08. Retrieved 2007-12-08. ^ "According to the survey, 8% of children had participated in role-playing events in nature during the last month" Morten, Gade (2005). "Danish larp by numbers" (PDF). Dissecting larp. Knudepunkt 2005. Retrieved 2007-07-29. ^ Larsson, Elge (2005). "Postmodernity and participation" (PDF). In Haggren, Kristoffer. Interacting Arts - International Issue 2005. Interacting Arts. Retrieved 2008-04-24. ^ Werkman, Rachel (2001). "Vampire: The Masquerade - a countercultural performance". In Lancaster, Kurt; Mikotowicz, Thomas J. Performing the force. McFarland. ISBN 978-0-7864-0895-5. ^ Baker, Andrew; Curasi, Carolyn (2008). Baker, Andrew, ed. "Consequences of Co-Creation in Fantasy-Based Consumption Communities: Netnographic Analysis of a Live Action Role Playing Organization" (PDF). Advances in Consumer Research. 35. Association for Consumer Research. ^ Konzack, Lars (2006). "Geek Culture: The 3rd Counter-Culture" (PDF). Fun 'n' Games 2006. Digital Games Research Association (DiGRA). Retrieved 2009-09-20. ^ a b c Leppälahti, Merja (2004). "About the Community of Role-Players" (PDF). In Markus Montola, Jaakko Stenros. Beyond Role and Play. Ropecon ry. ISBN 978-952-91-6843-9. ^ Cockrell, Eddie (2006). Darkon. Variety. Retrieved 2009-04-25. ^ Harvey, Dennis (2007). Monster Camp: The Story Of Nero Seattle. Variety. Retrieved 2009-08-14. ^ (Fatland 2005) "The popularity of larp [in the Nordic countries] has recently made it a feature of 'common knowledge', so that a Swedish journalist may refer to something unrelated as 'larp-like', Finnish TV produces a teen soap opera about fantasy larpers, and a Norwegian professor of theatre history routinely ends his course by mentioning larp as the 'new theatre'." ^ Müller, Olav Brostrup (2008). "We play an important role: Role play-writers are losing the battle for cultural assets" (in Norwegian). Klassekampen. Retrieved 2009-04-24. ^ a b Copier, Marinka (2005). "Connecting Worlds. Fantasy Role-Playing Games, Ritual Acts and the Magic Circle" (PDF). Proceedings of DiGRA 2005 Conference: Changing Views--Worlds in Play. Digital Games Research Association (DiGRA). Retrieved 2009-04-26. ^ Montola, Marcus (2007). "Urban Role-Play: The Next Generation of Role-Playing in Urban Space". In von Borries, Friedrich; Walz, Steffen P; Böttger, Matthias. Space Time Play. Computer Games, Architecture and Urbanism: the Next Level. Birkhäuser Basel. ISBN 978-3-7643-8415-9. That Lord of the Rings-induced stereotypical image of LARP started to crumble in the 90s as LARP based on anything from science fiction to Jane Austen began to emerge, taking gameplay from forests and castles into industrial halls, idyllic villas and city streets. ^ (Waern, Montola & Stenros 2009:1550) "The community is well documented through annual self-reflective books published by the annual "Nodal Point" events where theorists and practitioners meet to discuss larp"
^ Drachen, Anders; Smith, Jonas Heide (2008). "Player talk—the functions of communication in multiplayer role-playing games". Computers in Entertainment (CIE). 6 (4). New York: ACM. ISSN 1544-3574. Retrieved 2009-04-25. ^ Bainbridge, William Sims (2010). "Online Multiplayer Games". Synthesis Lectures on Information Concepts, Retrieval, and Services #13. Morgan & Claypool. p. 3. doi:10.2200/S00232ED1V01Y200912ICR013. With ubiquitous Internet connectivity, and mobile access through cellphones or PDAs, it is possible this genre could grow into a major industry, possibly integrated with traditional activities such as history-oriented tourism, nature trail hiking, or stock market trading. Dansky, Richard E. (Developer) (1996). Laws of the Night. White Wolf Publishing. ISBN 978-1-56504-506-4. Falk, Jennica; Davenport, Glorianna (2004). "Live Role-Playing Games: Implications for Pervasive Gaming" (PDF). Entertainment Computing – ICEC 2004. Lecture Notes in Computer Science. 3166. Springer Berlin / Heidelberg. pp. 127–138. ISBN 978-3-540-22947-6. Retrieved 2008-10-28. Fatland, Eirik (2005). "Knutepunkt and Nordic Live Role-playing: a crash course" (PDF). Dissecting larp. Knudepunkt 2005. Retrieved 2007-07-29. Kilgallon, John; Sandy Antunes; Mike Young (2001). Rules to Live by: A Live Action Roleplaying Conflict Resolution System. Interactivities Ink. ISBN 978-0-9708356-0-4. Montola, Markus; Stenros, Jaakko; Waern, Annika (2009). "Philosophies and strategies of pervasive larp design" (PDF). Larp, the Universe and Everything. Knutepunkt 2009. Retrieved 2009-05-08. Niven, Larry; Barnes, Steven (1981). Dream Park. Phantasia Press. ISBN 978-0-932096-09-8. Russo, Anthony; Heinig, Scott (1996). Star Wars Live-Action Adventures. West End Games. ISBN 978-0-87431-283-6. Tresca, Michael (2010). The Evolution of Fantasy Role-Playing Games. McFarland. ISBN 978-0-7864-5895-0. Tychsen, Anders; Hitchens, Michael; Brolund, Thea; Kavakli, Manolya (2005). "The Game Master". The Second Australasian Conference on Interactive Entertainment. Creativity and Cognition Studios Press. pp. 215–222. Retrieved 2008-12-03. Tychsen, Anders; Hitchens, Michael; Brolund, Thea; Kavakli, Manolya (July 2006). "Live Action Role-Playing Games: Control, Communication, Storytelling, and MMORPG Similarities". Games and Culture. 1 (3): 252–275. doi:10.1177/1555412006290445. Retrieved 2007-11-04.